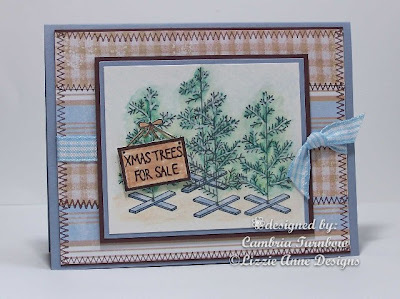 Another project using Lizzie Anne Design's Christmas in The City stamp set. 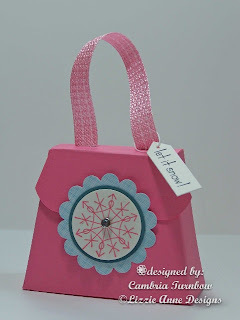 The little purse is made with my Cricut machine and the Tags, Bags, Boxes and More Cartridge. There is lip balm inside along with some little candies. I love the little purse!! (You can click on the photo for a larger view). 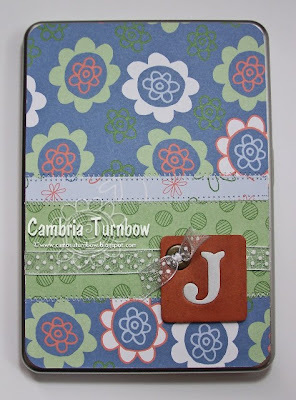 The card base is Blue Bayou (0ne of the new IN colors from SU!). 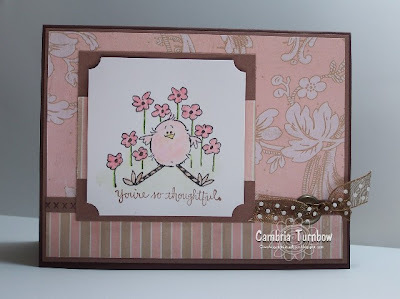 There is a layer of Regal Rose cs, then Chatterbox designer paper. The dots on the bottom and the scallops are the reverse side. I just LOVE double sided designer papers!!! The images are stamped on Stampin'Up! 's Shimmery white card stock (my favorite) then punched out with my 1/14 inch circle punch, layered on Regal Rose punched with the 1 3/8 circle punch, then all on top of the circle scallop punch. I also used the new photo corner punch for the corner. I layered the small one on another small one in Regal Rose, then layered on the bigger corner piece. The ribbon is from Micheals (Thanks Pam!). The little round jewels (bling bling baby) are from eP. Yes, I sewed across the bottom there... I was having withdrawals from my little Sew Mini. :) I feel better now. On the purse closure, I used a round rhinestone brad from SU! for the center of the snowflake. The blue matches nicely. If you have a Scor-Pal, it makes scoring the boxes from the Cricut a breeze. The machine leaves little marks where you score, so just line them up in a grove and SHAZAM, you are done. I love my Scor-Pal. Can you tell I'm into paper piecing lately? That's how I did the snowman above (see the scarf and the hat?) and the little hot chocolate cup. It's so much fun, and so easy. Just stamp your image on your card stock, then stamp it again on designer paper. Cut out the image on the designer paper and then adhere it over the top of the image you stamped on the card stock. 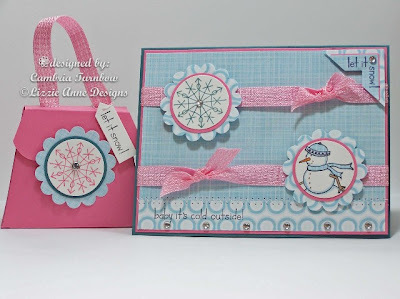 I used this embossing folder through the Cuttlebug after I stamped the snowflake with Craft Whisper White ink. I then took my Sakura Gelly Roll Black Glaze pen and went over the hot chocolate letters. It's so shiny and cool in person, you just have to touch it. Totally looks embossed. LOVE those pens!! The Regal Rose 5/8" ribbon is sewn on across the bottom. The card stock used for this card are Regal Rose, Purely Pomegranate, Almost Amethyst, Shimmery White, and Basic Black, all from Stampin'Up!. I think I'm catching up. If you've emailed me and I haven't answered yet, I haven't forgot about yah. The kids start school on the 5th and hopefully, by then, I'll be caught up on laundry. Good thing they have new socks and undies for school and aren't counting on that huh? LOL. Have a great weekend everyone!! Thanks for stopping by! 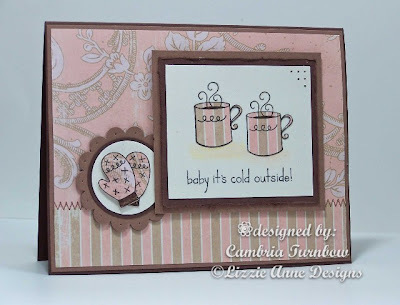 How Did You Emboss Just The Front W/The Cuttlebug? Okay... so I was feeling really horrible today (bad headaches), but when I got back to the computer, I had like six emails asking how I embossed just the front of my card with the Cuttlebug embossing folder. SO... no one better feel stupid!! LOL. It' s NOT a dumb question. Put down your big A sized white Cuttlebug pad, then your clear B size. 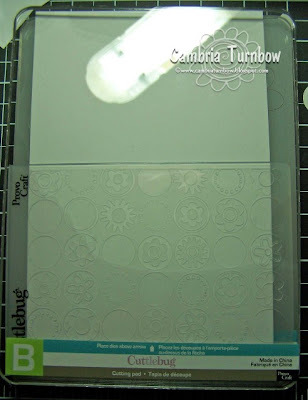 Lay down your embossing folder (landscape) and open it up. Place your card front in the folder. 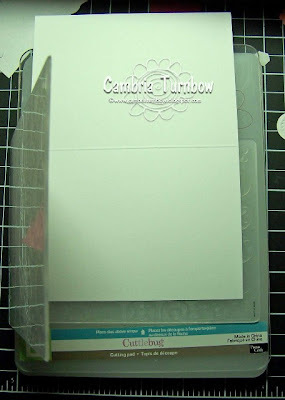 Close the embossing folder and line in up where you want your embossing to start. You need to line it up with your score line if you don't want your card to be embossed on the inside too. Leave the other side hanging out. I seriously had to giggle just a bit as I kept reading the same.... "I need to ask a stupid question" in each email. Trust me, it took awhile for me to figure out too. Oh, I needed a giggle today. Hope that helps. Sorry about the light reflection, but I just threw it down on my messy desk to show ya'll. Have a super evening and have fun Cuttlebuggin' baby!! I had some Stampin'Up! white note cards (they are 5" by 3 1/2") and needed to send out some thank you notes from Averie. Summer has just been crazy busy and my kids don't go back to school until September. So, easy it is baby. 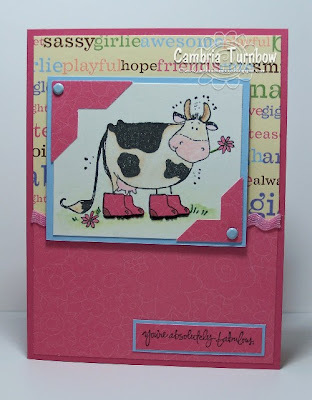 I ran the front flap through my Cuttlebug with this dry embossing folder. Then trimmed 1/8 th off the bottom and the top. I trimmed 1/2 inch off the side of the front flap. 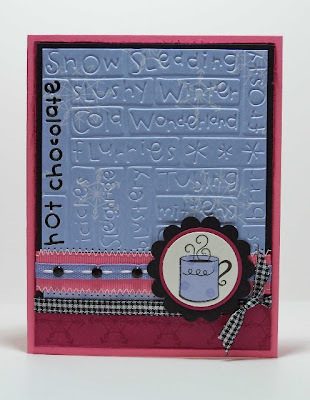 Then, cut a strip of designer paper from the Darling Doodles Double Sided DS Paper from Stampin Up! to fit down the side. I adhered the entire white note card on a piece of Purely Pomegranate card stock. I stamped the round thank you stamp from the Think Happy Thoughts Set onto Groovy Guava card stock with Purely Pomegranate ink. Punched it out with my 1 1/4 inch circle punch, layered that on a piece of Purely Pomegranate card stock punched out with my 1 3/8 inch punch. 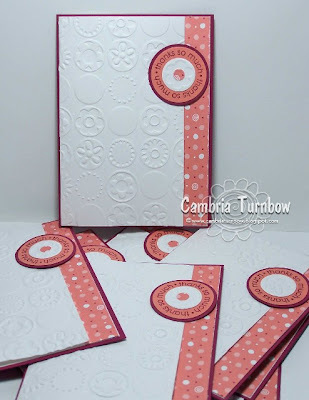 Next, I had a note card that I ran through the Cuttlebug (and ruined) so I used my 3/4 inch circle punch and punched out some of the embossed circle flowers. I glued that in the center and added some designer paper with my 1/4 inch circle punch to some of the centers. Then, I added two SU! dimensionals to the back. I took the 1 3/4 inch circle punch and punched about half way into the front flap. Close the flap and then stick your circle just over the punched out part. Because of the dimensionals, it's raised just enough to keep your front flap closed. Sentiment inside is from the stamp set In My Thoughts from Stampin'Up! I'm so proud of Averie... she signed each one by herself. She left out the r in her name on a few, but hey, she did it and was super excited to sit down and thank everyone. Have a super rest of the week and a fun weekend!! I register Sheldon (my oldest son) in HIGH SCHOOL tomorrow morning. I can't believe he's going to be a freshman. I think he grew at least two inches over the summer and is officially the tallest person in the house. New Lizzie Anne Designs....OH MY GOSH!!!!! OH MY GOSH!!! Lizzie Anne Designs has brand new sets coming!! Look... here's a sneak peek!!!! They are releasing four new designs a day for four days!!! Check them out!! OMGosh.. I totally cannot wait to get my hands on those stamps!! Let me know which are your favorites! I know I HAVE to have them. Should I say OH MY GOSH... just one more time? Oh yah baby... the purple pole was indeed a hit!! She caught more fish than anyone! She just kept reeling them in. I think fish like purple.....I'm not kidding. I even caught a nice bass with her pole. Standing behind her, is her cousin Emily, who is two months older. They had so much fun swimming and playing. I wish they didn't live so far away and we could get the girls together more often. 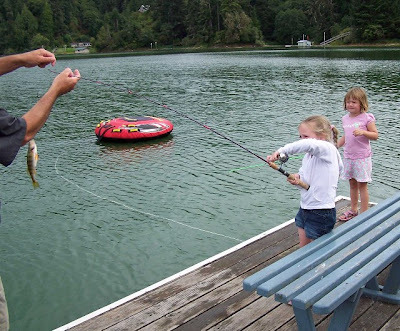 Those are Daddy's hands, because Mom doesn't do the worms or take the fish off. Jayce and Baylor love doing that part when we fish together. Thank goodness for my twins. 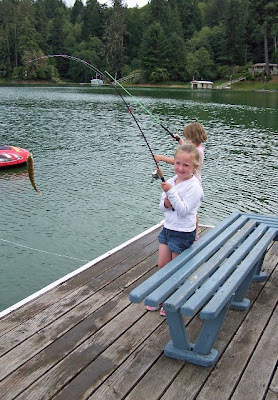 Here she is smiling a little more..... she didn't want to touch the fish either... who can blame her. They make your hands stink. LOL. She was totally thrilled when she kept pulling them in. She now loves her fishing pole. Thanks for all the nice birthday wishes for A. She had a great 5th birthday. Just one more photo to share (I took a ton). It was also my husband's birthday. We celebrated his on Friday. 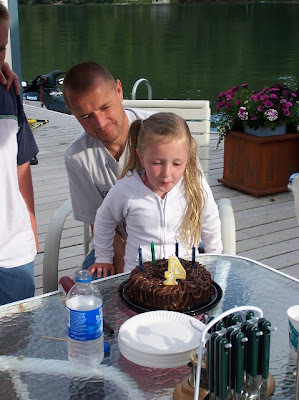 He wasn't really four, but 44 (guess who forgot candles?). A "helped" him blow them out. Steve hates celebrating his birthday, not because he's old, but because he doesn't like the attention. I can say he's old, because I am much younger than him! (wink). It was a great weekend, but I'm beat and trying to catch up on all the laundry and get ready for more company this weekend. My cousin is getting married and she is having her reception at the lake. This time, it's the other side of my family. I look forward to seeing everyone. Tuesday, my baby turned five. I can't believe it's been five years and that she will go to school soon. We had a family dinner, then she got a few presents from my parents and grandma because her party is on Saturday at the lake. She was SO funny. At the lake, the boys are always fishing. They have custom fishing poles from my parents with their names on them. Averie just had a little baby pole with a little line and hook. She was always using the Baylor's pole (when he let her). So, my parents went and had one made for her birthday. The look on her face was hilarious when she opened it. I think she was expecting something girly like a doll or makeup. 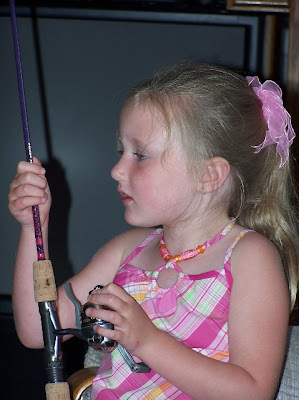 She was not happy about her fishing pole... even though it was purple and pink and had "Sweet Pea" engraved on it. That's what PaPa calls her. I think she would have been happy just borrowing Baylor's pole. LOL. 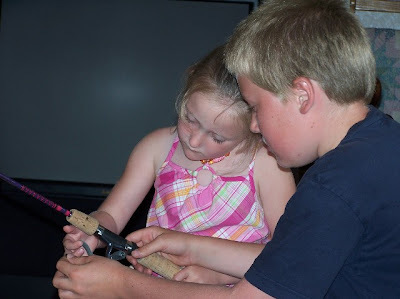 After Baylor put her reel on and showed her how to use it, she was warming up to the fact that she indeed was going to have her very own fishing pole. I'm sure once we get to the lake, she will be thrilled to have her own purple pole.... especially after she opens her other gifts and gets some girly things. LOL. Let's hope she can catch a fish with it!! Have a great weekend everyone!! Thanks for stopping by!!! Hey Juanita!!! Email me at cambriaturnbow@charter.net and I'll get you some of that paper okay? Oh, how I adore this set from Lizzie Anne Designs! You know, any sentiment with baby in it is totally ME. :) This weekend at the lake house, I was trying to use the whole sheet of 12x12 paper like my friend Lisa Zappa. 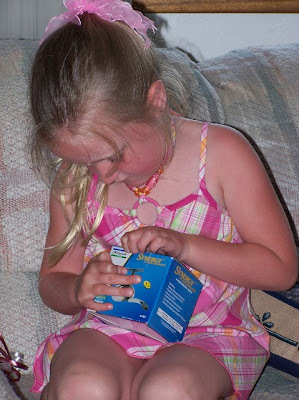 She just whips out cards... totally gives the phrase "gettin' er done" a new meaning! I wasn't as creative with layouts, but I used "almost" the whole sheet. I guess I need more practice. You stamp the image on the designer paper, cut it out, then stamp your image again on the card stock (shimmery white here), then glue your cut out piece over the top. I added some shading with my SU! watercolor crayons and my aquapainter. The stitching is not my beloved machine, but the stamp set Shapes and Stitches... fooled yah huh? I didn't want to give my husband a coronary by packing up my machine too. He said the boat was full.... pffftt. The designer paper is My Mind's Eye.... I scored a big pack from Costco after seeing it on Taylor's blog. This one with the trees is two sheets of paper, cut into strips, then pretend stitched with my Lizzie Anne set. The trees are also colored with my watercolor crayons and my aquapainter. I then added some highlights with my Sakura Gel pens. The main card stock is all Stampin'Up!, but the ribbon was just pieces of scraps I had in a bag. Some of it's SU!, some Cindy Ribbon, some... who knows what. It was the whole "limited supplies thing." I was packin' light baby. My friend Bev arrived back to Chicago late last night... I missed her this am while brewing my coffee.... that girl loves coffee. (Did you drink any water today Farton? )Pam and her both arrived home safe and sound. I can't believe they both traveled so far to hang out and stamp with me.... thanks girls!! I had to run one of my twins to Eugene for an ortho appt. and of course sneak in a quick stop to Costco and Toys R Us (for the birthday girl) today. Tomorrow more company is arriving.... family to celebrate Averie and my husband's birthday. Oh my.... I also need to register my twins at school tomorrow. Where has August gone? Anyone know? As always, thanks for stopping by, and for your sweet emails and comments!! I'm working on some blog candy!! Bevie Pearl brought me stuff for my blog... how sweet is she? More cards I made this weekend with my friends Bev and Pam. We had limited supplies, but I'm happy with how they turned out. 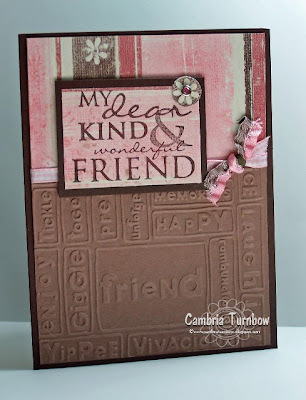 It was great fun stampin with my friends!! Between Grandma Louise (who drips with sweetness) and your oh-so-suave brother, Vic, you know that in life you can’t choose your own family. But at Stampin’ Up!, we’ve found a way to bend the rules so you can! Purchase the Starter Kit between August 10 and September 14, and you’ll get to pick the family of your choice-color family, that is-of Classic Stampin’ Pads® FREE. That’s a $57.95 value! And we’ve designed our exclusive coordinating color families (including our In Color collection) so that every color fits in. After all, it’s all in the family! Contact your demonstrator or locate one near you to find out more. Omgosh... I have so many things to share! My friends Bev Barton (who came from CHICAGO) and Pam Becker (From Bellvue, WA), came to stay with me at the lake house for the weekend!! We had SO much fun. I haven't stamped this much for ages. 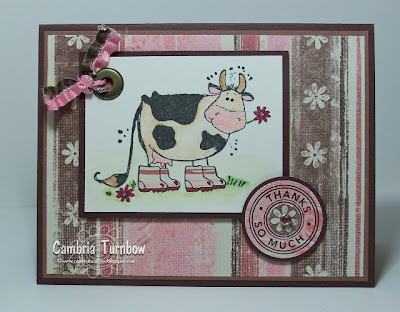 This cute cow is a stamp from Penny Black and was sent to me by my friend Jenny (thanks babe!). 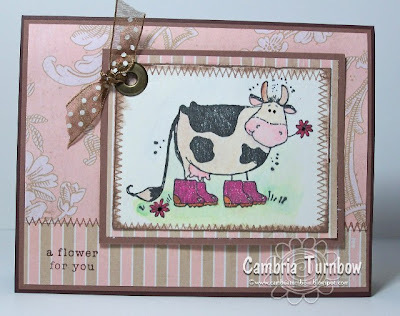 We had SO much fun stamping the boots out with designer paper! I did the coloring with Stampin Up! Watercolor Crayons on Shimmery White card stock. The thanks so much is from the SU! set Riveting. I had a blast using those new Large Eyelets from SU! with my Crop-a-dile. :) This one is my favorite. The paper is some that Bev brought.. I fell in love with it. This one is paper that Pam brought... again, I have no idea what brand or where it's from, but I love the little flowers on the pink part. I used the new corner punch from SU!, and brads from the soft subtle collection. The paper is Shimmery and Rose Romance with some Bashful Blue. the sentiment says, "You're absolutely Fabulous" (LOVE that set). Last but not least, is the cow with the sparkle boots! I had all these gel pens from Costco along with the paper (My Mind's Eye), that I hadn't used in forever. That is not really stitching from my machine, but from my Lizzie Anne Design set Shapes and Stitches. I love my LAD sets... and they were SO easy to pack up and take along! 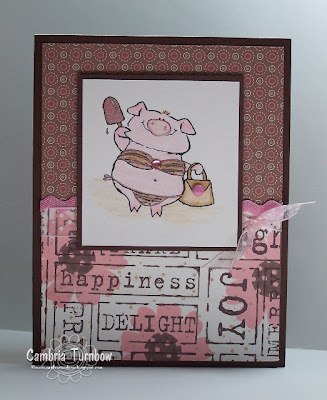 All the ribbon used is May Arts from Miss Cindy over at Starlitstudio. Okay... I have a ton of laundry to catch up on, and more company coming in on Thursday for Averie's birthday weekend (today she is five.... my baby is FIVE). I will try and post more later. Thanks for stopping by!! Hope you are all having a fun August!! I also used the new chipboard On Board Lots of Letters. I'm so impressed with how well they take color. The square part of the J was just rubbed on top of my Groovy Guava Classic Ink Pad. The J part is dabbed in Whisper White Craft Ink. I'm also digging those new Jumbo Eyelets. They set like buttah with my Crop-a-dile baby. I put together the front piece (cut at 5 x 7 1/4), and sewed across that strip (rounded the corners with the corner rounder punch), added the J and the ribbon, then used my snail adhesive to attach to the front. I did the same for the inside, but added a pocket, then adhered it down with lots of Snail. 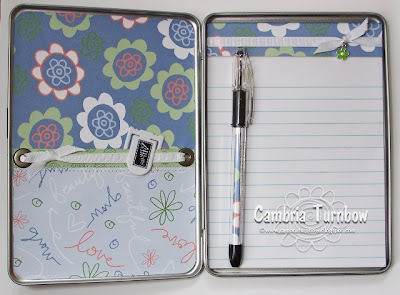 Covered the notepad with a bit of paper, some ribbon and a little flower charm. Then added a pen with some matching paper inside. Have a super weekend everyone!!! Janome Sew Mini Sale Starts Today!!! Thanks Jackie for the heads up! I LOVE this machine. It's a REAL sewing machine, not a craft machine. You can sew almost any fabric too.... not thick denim. If you are thinking about getting a small machine that you can easily store and move, this is it ladies!! Check it out here: Hancock Fabrics. Don't miss out... what a steal!! Have a good day everyone.... it's official August and my crazy days begin! I can't believe it's August!! Summer goes by too fast! !